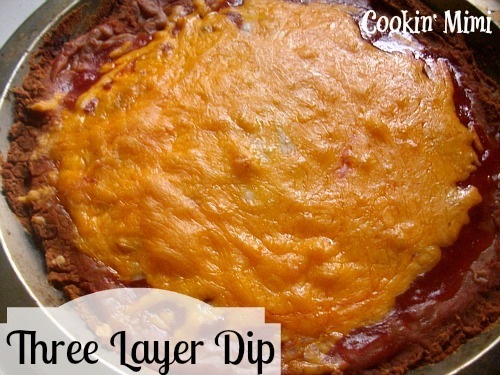 This is an incredibly easy dip. Just three ingredients that you layer in a pie pan or other oven safe dish and bake until bubbly. Serve with corn or tortillas chips and you have a delicious appetizer perfect for serving while watching football or during a family game night. 1 15 ounce can refried beans. This is one instance where I would recommend using canned refried beans. I’ve made it with homemade beans and it doesn’t work quite as well. 1/2 cup salsa. I used mild but feel free to use your preferred heat level. 1/2 to 1 cup shredded cheese. I used Cheddar but Monterey Jack or Pepper Jack would be excellent. In a 9 inch pie plate or other oven safe dish layer the beans, salsa and cheese. Serve with corn or tortilla chips. Looks delish! Love simple and easy recipes like this. I know it’s gotta be tasty!